Welcome to Precision - your Porsche Servicing and Porsche Bodywork specialist situated in the heart of Mid Sussex. We're fast becoming the South's favourite Porsche Independent by offering everything from routine Porsche servicing, engine remapping and maintenance through to full restorations and engine rebuilds, whilst ensuring your Porsche Warranty remains intact by using genuine Porsche parts. At Precision Porsche we look after all Porsche models from the classic 356 and 911, to the Boxster, Cayman and Cayenne through to the latest 991 and offer full Main Dealer Services at more competitive rates. 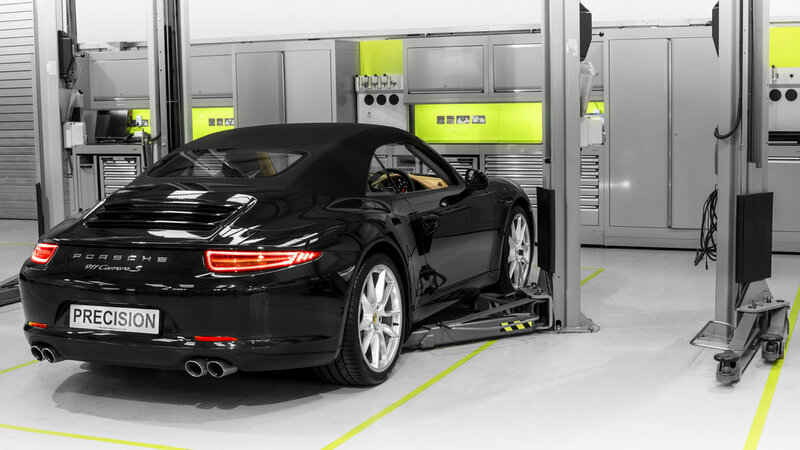 Our premises in Mid Sussex are light, spacious and customer-friendly, our staff knowledgeable and our dedicated workshops include the latest Porsche diagnostic equipment. Precision Porsche and Precision Prestige Bodywork operate as a highly successful joint venture. The two companies maintain and repair all Porsche models from the same, brand new premises. Using the very latest Porsche Diagnostic equipment we offer Main dealer Servicing on all Porsche models at more favourable rates than a Main Dealer. In conjunction with any service work, if our Porsche-trained technicians find any little bits that need fixing, or a new light bulb along the way, they will fix them, with no labour charge to the customer. We also make sure any Porsche warranties remain intact by using genuine Porsche parts. Our team is fully experienced in all aspects of Porsche maintenance and bodywork with many years of looking after Porsche cars. Our expertise and enthusiasm in all things Porsche, extends to getting the very best from whatever project we are working on, be it a 997 in for an engine rebuild, a 1973 2.7 RS being prepared for a concours event or a Panamera in for engine remapping. We look forward to meeting customers old and new, so next time you're in the area enjoying the A-road twisties that surround us, drop in and say hello. The world famous Bluebell Railway is on our doorstep and has now extended its line to East Grinstead Railway Station where a train service runs to London Victoria and London Bridge. The Bluebell Railway is a fun day out for all the family and they regularly put on special events, so keep an eye on their website and maybe combine it with a visit to Precision.